Today is the day: Sat 30th August 2014. Hanging like a mofo. I believe that’s the phrase. I am something of a reformed drinker these days – I was a horrible boozer throughout my twenties, earning myself the nickname ‘boozehound’ as I staggered around University and then Harborne with a bottle of wine in one hand and my tattered dignity in the other. Having Blake has changed my attitude to drink. I’m not such a fan these days because a) I cannot lie reeking of booze, on a pillow covered in the makeup I did not remove the night before, recovering all day – my child won’t look after himself b) a hangover immediately compromises my ability to be the best Mum I can. It’s hard enough work being a Mummy without feeling like an animal died in your mouth, your stomach is about to explode and your brain is trying fight it’s way out through your forehead. So I made a decision at the beginning of the year that it’s just not worth it. If I have a drink at all (I have completed a few dry months over the course of the year) I limit myself to two glasses except on special occasions. And that suits me well – I can still be a good Mum the next day and am not eaten up by guilt at my own selfishness. But things happen sometimes don’t they? (DON’T THEY? Please tell me it’s not just me.) Last night a very dear, long term friend of mine popped over for a takeaway and a film. I’d got a nice bottle of SauvBlanc (ARSE, just call it WINE and be done with it) in in preparation. 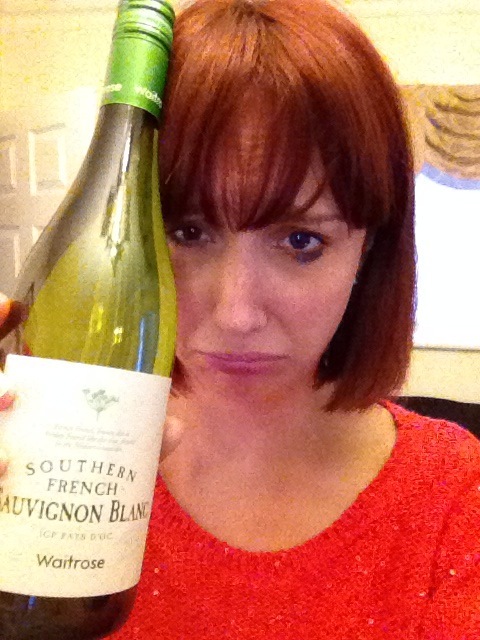 She came equipped with tales of a tough week at work, and two more bottles. We were done for. By the time the takeaway arrived one bottle was gone, there was wild gesticulation and my poor Husband was looking completely confused as we did that thing drunk Women do and communicated in wild jabbering that made COMPLETE sense to us but is unintelligible to anyone else. Fast forward to 1am, all the wine was gone, we were telling each other how much we loved each other and I’m hazily aware that we may have been running around outside the house. I am looking forward to bed. Tomorrow will be a new wine free day, we will do something together as a family and I will be a better Mum. And next time Vicki comes over maybe we will just limit it to one bottle and then switch to tea.